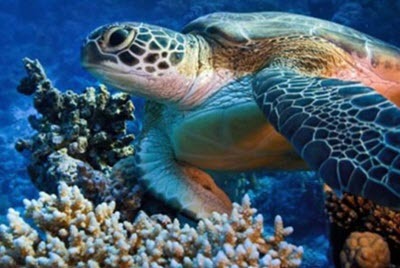 The Caribbean region has a high level of biodiversity, both on land and in freshwater and saltwater. Many species are endemic to the Caribbean, including a very large percentage of the reptiles found here. The many islands in the region favors the development of endemic land species, since animals that happen to reach an island from the mainland, e.g. on driftwood, become isolated there and develop into new species. An estimated 13,000 plant species grow in the Caribbean, of which approximately 6,500 are endemic to the region. The vegetation varies throughout the Caribbean based on factors such as topography, elevation, soil type, exposure to salt, and access to freshwater. Areas where there plants are exposed to a lot of salt are for instance likely to feature salt tolerant species such as mangrove and coconut palms. Traditionally, ports on Central America’s Caribbean side have been important for the export of hardwood timber, both timber grown in the Caribbean and timber transported out to the ocean from inland locations. On the leeward side of Caribbean lagoons, you are likely to find sea grasses, such as manatee grass and turtle grass. Some sea grasses are capable of growing surprisingly deep down; there is for instance several members of the genus Halophila that can grow 30 meters below the sea surface. Other sea grasses crave shallower depths. Halodule wrightii is a sea grass that grows on sandy and muddy bottoms where the water is no more than 5 meters deep. Ruppia maritima want’s even more shallow water and is therefore typically found in estuaries. Hutias are medium-sized cavy-looking rodents found only in the Caribbean. The two most well-known species are the Prehensile-tailed hutia and Desmarest’s hutia. The Prehensile-tailed hutia is endemic to Cuba, where it lives in the forest. The Caribbean is a haven for bats and a rich profusion of bat species have been reported from this region. There is over 60 different species living on Trinidad alone! Bats of the families Natalidae, Molossidae, Mormoopidae, Noctilionidae, Phyllostomidae, and Vespertilionidae are found in many different parts of the Caribbean, while members of the Emballonuridae, Furipteridae and Thyropteridae can only be encountered on the Caribbean mainland and on some islands located close to the mainland. Rather few species of the order Carnivora can be found on the Caribbean islands, and many of these islands and islets are too small to support large apex predators such as jaguars. The situation is different if we look at the Caribbean mainland, especially areas where the coast is connected to large inland areas of undisturbed forest where larger predators can roam. 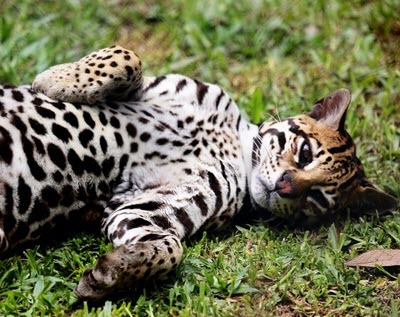 Trinidad is a bit of an exception, since it is home to Ocelots (Leopardus pardalis). Trinidad is one of the largest islands in the Caribbean and it sits comparatively close to the South American mainland. The Tayra, an omnivorous member of the weasel family, also live in Trinidad. On the island of Cozumel, which isn’t far from the Mexican mainland, we find the Cozumel coati, the Cozumel racoon and the Cozumel fox. All three are diminutive in size compared to their mainland relatives the White-nosed coati, the Procyon spp. an the Gray fox. When it comes raccoons of the species Common raccoon (Procyon lotor) it is difficult to know if specimens encountered on Caribbean islands are naturally occuring or if they have been introduced (deliberately or accidentally) by humans fairly recently in the island’s history. P. lotor is a widespread species in North and Central American and it readily adapts to new environments, so introduced specimens can be expected to thrive on most of the islands. One example of a species that we know for sure was deliberately introduced by man to the Caribbean is the Javan mongoose. It’s native to Asia, but was brought to sugarcane plantations in the Caribbean to kill crop-destroying rats. From 1870 and onward, it was introduced to islands such as Jamaica, Cuba, Hispaniola, and St. Croix where it thrived and caused serious problems for the native fauna. It is still present on at least 28 islands in the Caribbean. Some sources recognized the white-fronted capuchins on Trinidad as a subspecies: Cebus albifrons trinitatis. The Solenodons are venomous, nocturnal, burrowing, insectivorous mammals endemic to the Caribbean. There are two extant species of Solenodons: the Cuban solenodon and the Hispaniolan solenodon. Both species have venomous saliva. The Hispaniolan solenodon lives in the forest in the Dominican Republic and parts of southern Haiti, typically below 1,000 m elevation. Close to agricultural lands, it is sometimes spotted even higher up than this. It inhabit a wide range of habitats, including lowland dry forest and highland pine forest. The Cuban solenodon is a very reclusive animal that is rarely seen by humans. We therefore know very little about it, not even its exact range or basic habits. The species was even declared extinct in 1970, but then showed up again in 1974. It has only been encountered in Cuba and is thus considered endemic to this island. Several opossum species inhabit the Caribbean and some have made it out to the islands. The large opposum Didelphis marsupialis lived on many different islands, including Trinidad, Tobago, Martinique, Saint Lucia, Saint Vincent, Grenada, Carriacou, Mustique, Bequia, Cozumel, and Roatán. Robinson’s mouse opossum (Marmosa robinsoni) has been reported from islands such as Trinidad, Tobago, Grenada, and Roatán. Marmosa murina, Marmosops fuscatus and Chironectes minimus lives on Trinidad, with some reports of M. murina also being present on Tobago. Caluromys philander lives on Trinidad and on the Venezuelan island Isla de Margarita. Caluromys derbianus lives on the Panamanian island Islan Escudo de Veraguas. The Eastern cottontail rabbit lives on Aruba, Curaçao, Isla de Margarita, and Islas de los Testigos. Approximately 600 species of bird have been reported from the Caribbean, including 160+ endemic species. Examples of bird species endemic to the Caribbean are Puerto Rican amazon (endemic to the Puerto Rican archipelago), Zapata wren (endemic to the Zapata peninsula), Palmchat (the national bird of the Dominican republic, endemic to Hispaniola, Saona and Gonâve), and Fernandina’s flicker (a woodpecker endemic to Cuba). 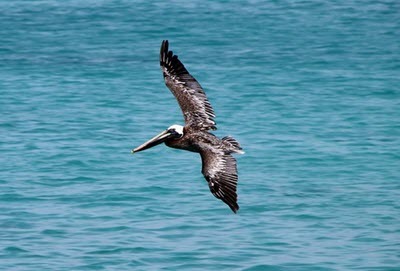 Many migrating birds rest in the Caribbean on their way to North or South America. Roughly 500 species of reptiles have been reported from the Caribbean’s and a very large percentage of them are endemic to the region. One example of a reptilian that isn’t endemic is the American crocodile (Crocodylus acutus). Several different species of iguana live in the Caribbean, including the Blue iguana (on Grand Cayman), the Rhinoceros iguana (on Hispaniola) and the Mona ground iguana (on the island of Mona in Puerto Rico). There are roughly 170 species of amphibians in the Caribbean, most of the endemic to the region. One famous example is the Golden coquí frog, who only live in a small part of Puerto Rico where there are a lot of bromeliads.